He was born in Germany in 1883 in Munchengladbach, one of nine children and during part of his childhood his parents ran a gym. As a youngster he was often poorly and suffered from some significant health problems such as asthma and rheumatic fever. However, he dedicated himself to improving his physical strength and his health. He did this initially by trying out a variety of practices, including: yoga, gymnastics, dance, circus training, weight training, martial arts and self-defence. 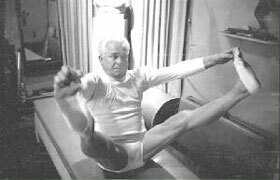 Sadly, Joseph Pilates was bullied as a child which may have influenced the interest in self-defence. He became sufficiently skilled in physical fitness that he could earn a living as a boxer and a circus performer and this brought him to the UK. The First World War broke out when he was in the UK and as a German national, Pilates was placed in an Internment Camp, firstly in Lancaster and subsequently on the the Isle of Man. Here his interest in health led him to help out in the camp’s sick bay. He had already spent much time developing his own, new, exercise system but now he further refined it by inventing his first equipment using the hospital bed as a base and attaching levers, springs and pulleys to exercise muscles against variable resistances. These early prototypes became what we know as the Trapeze Table and Reformer. 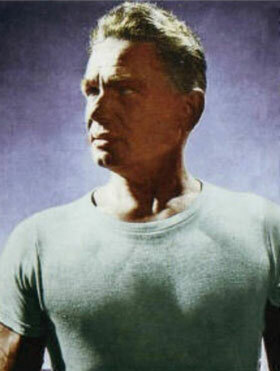 He emerged from the World War One with the basis of the exercise system which he called Contrology. He returned to Germany and taught physical fitness and self defence to the Police in Hamburg. There was work available to him in Germany but unhappy with the prevailing political situation he decided to go the US. It was on his second visit there that he stayed for good and on his second boat trip he met his life partner, Clara. Together he and Clara set up a studio in New York to teach this new method of movement. Among their first clients were elite dancers needing rehabilitation following injury. The dancers in particular had an influence on the further development of the method. 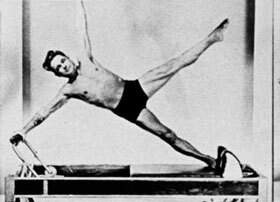 Joseph Pilates taught in the studio until 1966. He died in 1967. Clara, a skilled teacher in her own right carried on teaching until her death in 1977. Contrology was then carried on by a dedicated band of his followers who had also become teachers and who carried on teaching his system, which came to be known, not as Contrology, but by his name. Pilates has carried on evolving. Not only do we have the original matwork exercises and exercises for the studio equipment, but the method can be applied to new exercises done with the right approach – mind/body training leading to good, thoughtful movement. Pilates has absorbed the latest research in biomechanics and anatomy which has further influenced development. Contrology is the complete coordination of the body, mind and spirit. Through Contrology you first purposefully acquire complete control of your own body and then, through proper repetition of its exercises, you gradually and progressively acquire that natural rhythm and coordination associated with all your mental and subconscious activities. Contrology is designed to give you suppleness, natural grace and skill that will be unmistakably reflected in the way you walk, play and work. You will develop muscular power with corresponding endurance, ability to perform arduous activities, to play strenuous games, to walk, run or travel for long distances without undue body fatigue or mental strain. My definition is a little more prosaic! Above all, it is an exercise method which aims to enable the practitioner to move better. Many people rightly think of Pilates as associated with posture, and movement is really dynamic (moving) posture. 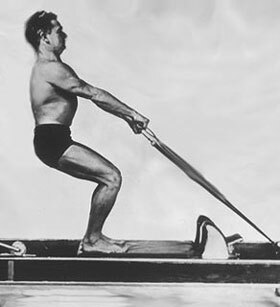 Joseph Pilates was decades ahead of his time when he claimed in the 1950s that modern lifestyle, inefficient breathing and bad posture are at the root of bad health. The more Pilates I do, the more training I undertake and the more reading around the subject I do, the more I have come to believe that good movement is vitally important and something of tremendous importance that Pilates can deliver. Although the movements you do are performed by your body they arise from the mind and body and breath working in harmony and that harmonious connection is hugely valuable.